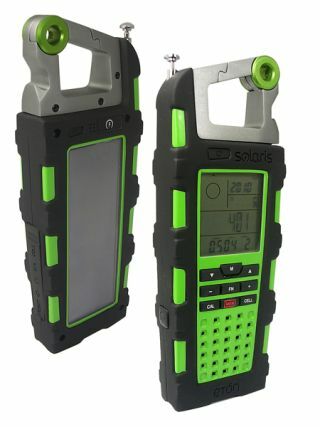 Solar-powered Eton Raptor radio charges your mobile | What Hi-Fi? Now here's something you rugged outdoor types might like: an all-purpose FM/AM/SW radio that doubles as a torch and compass. This solar-powered device will charge your mobile phone, includes an LED torch, altimeter, barometer, compass, alarm clock – and even a bottle opener! It's rated as IPX4 standard splashproof, which means it can withstand a direct shower for five minutes, has a rugged, rubberised case and weighs 320g. An aluminium carabiner clip means you can hang it from a rucksack or guy rope, and hidden behind a rubber flap you'll find a USB outut for charging other gadgets. A Mini USB input allows you to charge the Raptor's lithium-ion battery from the mains, giving up to 30 hours playback when you're out and about. There's also a headphone socket and an audio input, so you can play music from your smartphone or MP3 player. The Eton Raptro is available now for £100 from www.nevadaradio.co.uk.